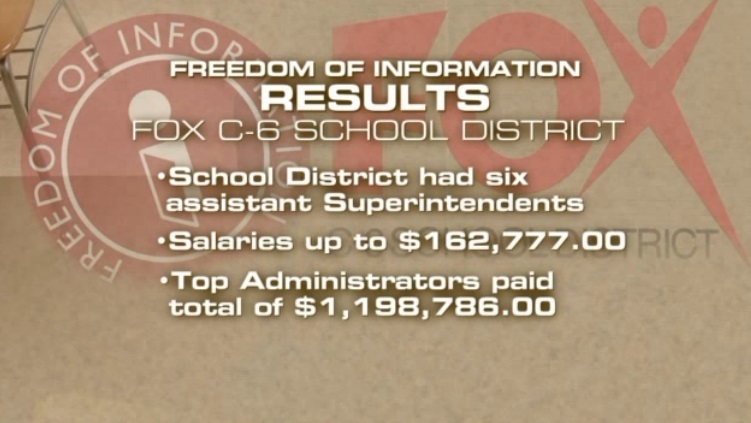 As you can see, Fox has problems with both the salaries and the sheer number of administrators. One of the most recent administrators to hop on board the gravy train was Andy Arbeitman ($136,000 salary), who was previously given the ax as De Soto superintendent. He walked away, though, with $208,000. Maybe he is currently giving Dianne Critchlow some pointers in how to fleece the taxpayers. And he was hired unanimously; remember that when John Laughlin says we had a bad board then and a good board now (he was on the board when Arbeitman was hired). The board also recently (unanimously) hired as CFO John Brazeal ($165,000 salary), a guy who is tied in tight with Arnold government, having served as city administrator and council member (and consultant to a developer that was dealing with the city). One member of the school board is Dan Kroupa, who is Arnold’s treasurer. And Brazeal previously worked at Affton School District, where Arnold police chief Bob Shockey was once on the school board. So many connections. And the best part of the Davis piece is this shot of board member Cheryl Hermann, who I deem to be most guilty of all current board members for the current problems due to her long tenure on the board (since 2000), fleeing into the ladies’ bathroom to avoid Davis’ questions. Remember this piece 9 months from now if Hermann dares to run for re-election. Fox C-6 board member Cheryl Hermann flees from Fox2’s Elliot Davis. Seems in Jefferson County, and especially Arnold, it’s not what you know but who you know. I think Cheryl needs to resign from the board now. Someone should track her steps of involvement in all this mess. I understand she is very good friends to Diane. That in itself is a problem.